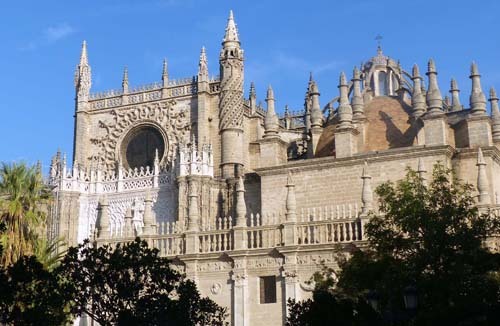 It was our second day in the City of Seville in Southern Spain. 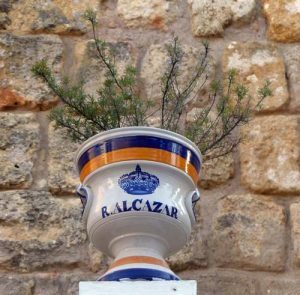 We’d planned visits to the Real Alcázar, a royal palace, and to the City’s bull ring as well as a ride in a horse drawn carriage. Agustin, our tour leader, led us along the narrow cobbled streets of the City’s former Jewish district. Primarily inhabited by Jews in the 15th century, it is now one of Seville’s most expensive areas. Little metal plaques memorializing some of Bizet’s most famous operas were stamped on the ground. 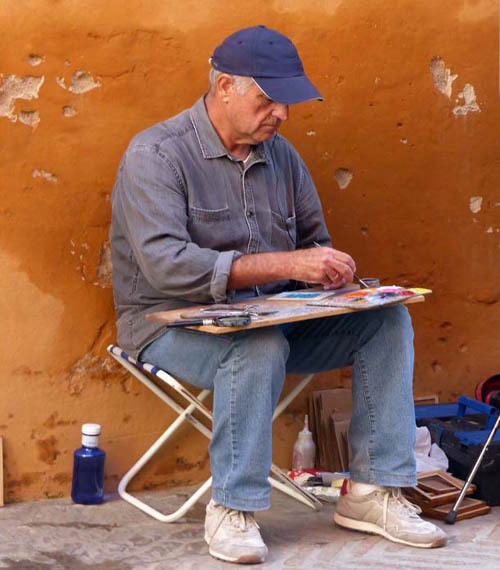 Street musicians entertained passers-by and talented artists painted scenes of the Andalusian countryside. Just ahead, was our destination: the Real Alcázar. In 913 the Moors built a fort on this site. 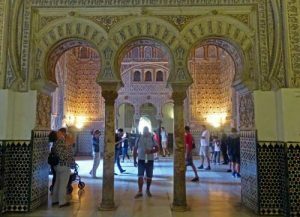 From the mid-1400s to the mid-1600s, individual residences were added by three different Catholic kings, all of whom employed skilled Moorish artisans. It is an impressive complex of patios and decorated halls in a unique style of architecture (part Gothic and part Islamic). We approached the Alcázar via the Lion’s Gate above which is an heraldic lion fashioned from ceramic tiles. Once inside we were overwhelmed by the intricate patterns, ornate domes, horse-shoe shaped arches and unusual water features. This tour was a feast for our senses. Central to the Palace of Pedro 1 with its elaborately styled façade is the open-air Patio of the Maidens. 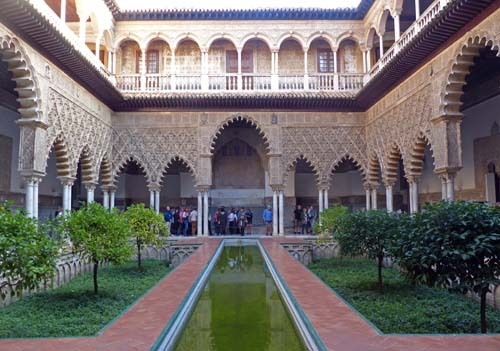 In the centre of the courtyard was an elongated reflecting pool. On either side were low manicured hedges, sunken gardens, slender columns and graceful scalloped archways. It was a picture of tranquility. Moving on, we approached the Hall of the Ambassadors once used by Pedro 1 for ceremonial purposes. Square in shape the room is crowned with a Moorish-style glittering golden dome of exquisite workmanship. On the walls were Christian and Arabic lettering and motifs. History tells us that in this room in 1526 Isabella of Portugal wed Emperor Carlos V. Under his rule, Spain became the most powerful nation in Europe. Soaring vaulted Gothic arches define the Halls of Carlos V whose walls are draped with tapestries and patterned glazed tiles in shades of blue and white covered the floor. Lastly we walked around the extensive manicured gardens. One of the chief attractions was the Water Organ. Together with other sightseers, we listened to a brief musical interlude at the top of the hour. Operated hydraulically, it is one of only three such idiosyncratic showpieces in Europe. Distinct from the elaborate splendour of the Alcázar, was the Plaza de Toros, one of the oldest and finest of Spanish bullrings. Painted white with yellow ochre trim it was hard to miss this Baroque-style building. In front the main entrance is a bronze statue honouring the famous bullfighter, Pepe Luis Vázquez, one of the ten greatest matadors of the 20th century. The sculpture symbolizes the matador proudly holding his processional cloak and sword. Our audio tour began with a visit to the bullring’s museum where we learned about the sport’s history over the past 200 years. There were portraits of famous bulls and toreros as well as their brightly coloured silk jackets heavily embroidered in gold and paired with skin-tight pants. In family tradition or to escape poverty, these determined men have an unquenched desire for glory, pride in their skill and are infused with great courage. We paused at a small chapel where the bullfighters pray for a good outcome before entering the amphitheatre. Beside it is an infirmary for those who need emergency treatment. 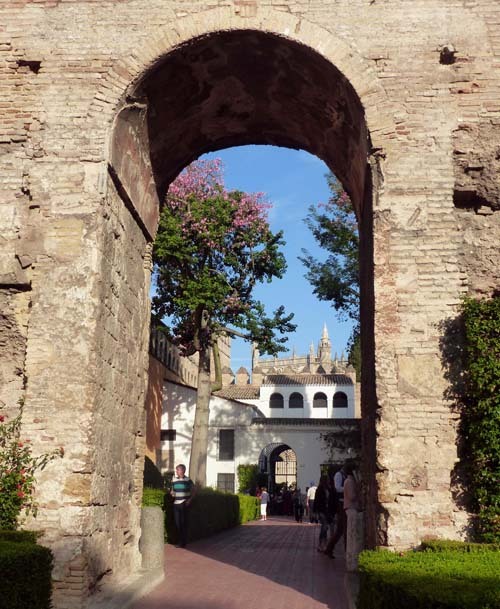 We followed the matador’s journey to the centre of the arcaded arena. It has a bright yellow sandy floor and is encircled by a protective barricade. At this point the eyes of up to 14,000 spectators would be upon the matador as he waited for the bull’s entry. Small and totally alone he would be dwarfed by this grandiose stadium. If successful, a torero might dedicate his conquest to a fervent admirer to whom he would present the bull’s ear. Triumphant, he would be carried out of the arena on the shoulders of his supporters. The season had ended a few weeks prior to our visit but a frisson of excitement still hovered in the air. That evening we enjoyed a touristy but fun 45-minute ride in a 19th century horse-drawn carriage. These open-air buggies are an integral part of Andalusia’s heritage. We settled ourselves in a 4-seater convertible Landau that sported bright yellow wheels. Our horse clip clopped along wide avenues undeterred by the bustling traffic. We disembarked at the Plaza de España which was built for the World Fair in 1929. Flanked by two towers, this massive semi-circular building is remarkable for its sheer scale and grandeur. Covering the equivalent of five football pitches, it even has its own system of mini-canals and bridges as well as a central fountain. Today the building houses various government offices and has been the set of several movies. Accompanied by the rhythmic trot of the horses’ hooves we made our return journey. The light was slowly fading from the sky and many of the babbling fountains were now illuminated by dancing lights. Much later we sat at an outdoor table in a neighbourhood restaurant whose smells and tastes are designed “to make you happy”. We watched the world go by as we savoured a light meal of typical Andalusian tapas. These delicious little plates of goodness are small portions of foods served either hot or cold. We chose from a wide choice of tasty dishes including garlic shrimp, breaded and deep-fried artichokes, fried potatoes covered in a tomato based sauce, ham croquettes and tuna tartar. We thoroughly enjoyed the lively vibe all around us. But with midnight fast approaching, we decided to round off our long day of sightseeing by indulging in the ultimate Spanish treat. A serving of light, crispy, cinnamon coated churros dipped into a steaming mug of thick dark rich chocolate. It was to die for! We’d spent a busy and enriching day in Seville, a City that throbs with life and vitality 24 hours a day.